In addition to promoting the safety and soundness of FDIC-insured institutions, the FDIC plays a strong consumer protection role. The agency enforces compliance with consumer protection laws, including fair lending and community reinvestment. It also educates banks and consumers in areas such as fair lending, community reinvestment and deposit insurance. The FDICs consumer protection activities are carried out primarily through its Division of Compliance and Consumer Affairs (DCA), with support from other divisions and offices. The FDIC continued working with the other federal bank and thrift regulatory agencies to complete implementing 1995 revisions to rules that implement the Community Reinvestment Act (CRA), a law that encourages federally insured lenders to help meet the credit needs of their communities. The 1995 rules significantly changed the way financial institutions are evaluated for CRA compliance. The new rules emphasize evaluating an institution based on actual lending, investment and service, and they establish different tests for different sizes and types of institutions. The revised CRA rules were phased in over a two-year period that ended on July 1, 1997, when new examination procedures for large financial institutions took effect. Among the 1997 initiatives by the FDIC and the other regulatory agencies to implement the new CRA rules were: issuing revised CRA examination procedures and sample performance evaluation guidelines for large institutions; updating the interagency CRA Question and Answer Guide for financial institutions; and training more than 300 examiners across the country in the new CRA examination procedures for large banks. The agencies have agreed to continue working in 1998 on a project to further promote consistency among the agencies in implementing CRA examination procedures for large banks. The FDIC is strongly committed to ensuring that lenders give equal and fair treatment to all loan applicants. In 1997, the FDICs continued efforts in fair lending included discussions with the U.S. Department of Justice and the U.S. Department of Housing and Urban Development (HUD) to refine procedures for exchanging information about potential violations of the Fair Housing Act and the Equal Credit Opportunity Act. In June, the federal bank regulatory agencies and the Federal Trade Commission entered into a Memorandum of Understanding with HUD establishing procedures for exchanging fair lending information with the Federal National Mortgage Association (Fannie Mae) and the Federal Home Loan Mortgage Corporation (Freddie Mac), two major housing-related government-sponsored enterprises. DCA examines FDIC-supervised banks for compliance with consumer protection, fair lending, and community reinvestment laws and regulations. During 1997, the FDIC initiated 1,990 such examinations, representing 32 percent of the financial institutions supervised by the FDIC at year-end. The percentage of institutions that were rated satisfactory or outstanding for compliance with consumer protection laws remained constant over the past two years. At year-end, 95 percent of FDIC-supervised banks were rated satisfactory or outstanding for compliance with consumer protection and fair lending laws, while 99 percent were rated satisfactory or outstanding for compliance with the CRA. These percentages are essentially unchanged from a year earlier. During 1997, a total of 139 FDIC-supervised banks were required to reimburse nearly $1.6 million to 49,100 consumers for violations of the Truth in Lending Act, which requires accurate disclosures of interest rates and finance charges. The reimbursements ordered in 1997 stem from compliance examinations conducted in 1997 and in previous years. The FDIC took a number of steps during the year to streamline and refine the compliance examination process. The FDIC instituted a new case manager approach to bank supervision (click here), significantly enhancing the examination and enforcement processes. The new approach allows the FDIC to focus on the activities and management of all affiliated institutions in a holding company or affiliate organization, rather than just on one institution. The case manager system will strengthen the FDICs enforcement of institution compliance with fair lending, community reinvestment and other consumer protection laws. FDIC and Federl Reserve employees join in an "on-line conference" on electronic banking and Year 2000 challenges. The FDIC also refined its consumer lending training program for compliance examiners, with increased emphasis on examination techniques and methodology. The core training requirements for compliance examiners now incorporate a new focus on the revised CRA rules and examination policies. Community Contacts Database, a centralized interagency list of community organizations or other entities involved in community reinvestment activities of banks and thrifts. For information on other automated examination programs, (click here). Financial institutions increasingly are using technology to provide financial products and services. Many recent enhancements involve automated teller machines, smart cards, video-kiosks, and home banking by phone, computer or interactive television (Web TV). At year-end 1997, a total of 602 FDIC-supervised banks operated home pages on the Internet. Thirty-four were transactional sites that provided customers the ability to pay bills, transfer funds and open accounts. The others were information only sites that described the banks products and services. While institutions on the Internet represent a small segment of all financial institutions, acceptance of the new technology by consumers and financial institutions is increasing rapidly. Expanding examiner training to incorporate a segment on the impact of electronic banking on the legal and regulatory environment. Participating in a Federal Financial Institutions Examination Council working group that focused on electronic banking issues and interagency examination policies on consumer protection and fair lending laws, and advised examiners in these areas. Coordinating participation by the regulatory agencies in an Internet conference for financial institutions that responded to 15 major industry questions on electronic banking. For more information on electronic banking (click here). The FDIC offers a wide range of educational information and assistance to tens of thousands of consumers and financial institutions each year. DCAs main vehicle for providing deposit insurance and consumer protection information is its toll-free Call Center (1-800-934-3342 or 1-800-925-4618 for the deaf). During 1997, more than 70,000 consumers and bankers contacted the DCA Call Center with questions about FDIC deposit insurance or consumer protection matters. DCA regional offices received another 15,000 calls. DCA also responded to 1,522 written inquiries from consumers and 320 written inquiries from financial institutions. Another 555 inquiries were received through the Internet (click here). Use of the electronic mail to contact the FDIC increased in 1997, with the agency receiving an average of 45 inquiries per month, compared to 10 per month in 1996. Most consumer inquiries in 1997 concerned deposit insurance coverage, determining if a financial institution is FDIC-insured, requests for FDIC publications, consumers rights under the consumer protection regulations, and how to file a consumer complaint. Most financial institution inquiries concerned the deposit insurance rules, requests for FDIC publications and consumer brochures, and questions about general banking or regulatory matters, including fair lending, community reinvestment and consumer protection laws. The FDIC develops and distributes informational brochures on deposit insurance and other topics of interest to consumers. The FDICs most popular brochure is Your Insured Deposits, which explains the rules for insurance coverage of deposit accounts. During 1997, the FDIC issued a new consumer brochure, Your Investments, about financial institution investment products, such as mutual funds and annuities, that are not deposits and are not insured by the FDIC. The FDIC frequently conducts training and outreach activities to promote an understanding of deposit insurance and consumer protection laws. 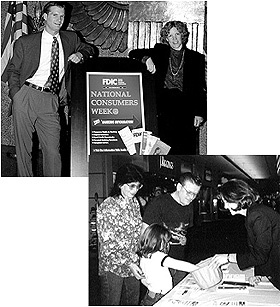 The FDIC conducted several major outreach initiatives locally and nationally in October 1997 in observance of National Consumers Week, such as training sessions for bankers on consumer protection issues, joint outreach efforts with local consumer organizations, and consumer focus groups. Because the staff of an insured institution generally is a customers first source of information about deposit insurance, the FDIC conducted 12 insurance seminars for employees of institutions in eight states during 1997. Approximately 430 financial institution employees attended these sessions, which provided an in-depth review of the deposit insurance regulations and interagency guidelines for the sale of nondeposit investment products. 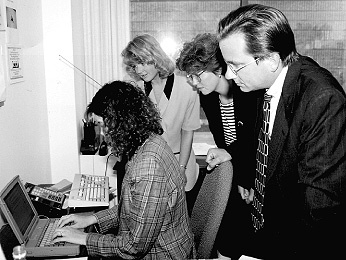 In 1997, DCA continued to expand its use of the Internet to provide information about deposit insurance and consumer protections. DCA began developing an interactive Internet application that will allow consumers to enter information about their accounts and determine whether their funds are fully insured under the FDIC deposit insurance rules. The application is expected to be on the Internet in the third quarter of 1998. The FDIC investigates complaints it receives from consumers about FDIC-supervised financial institutions. It also tracks the volume and nature of these complaints to monitor trends and identify emerging issues that may raise consumer protection concerns. In 1997, DCA received more than 3,600 written consumer complaints against FDIC-supervised banks, most concerning consumer credit card accounts, as has been the trend over the past few years. About half of all complaints involved a small number of specialized credit-card banks that manage large credit-card loan portfolios. The most common complaints typically involved the adverse action notice that financial institutions must provide consumers under the Equal Credit Opportunity Act when denying a credit application; credit card billing errors and disputes with merchants; the advertising of loan products, particularly credit cards; and creditors requirements for a co-signor as a condition of loan approval. The FDICs Office of Legislative Affairs, with the assistance of other divisions and offices, sent 1,385 letters to members of Congress in 1997. Many were in response to constituent complaints about financial institutions compliance with fair lending and consumer protection laws. The FDICs Office of the Ombudsman handled more than 55,000 inquiries and requests for information in 1997. The office provides guidance to consumers on where to get information throughout the agency and acts as an impartial third party to assist consumers and bankers who have had problems working with the agency. The Ombudsmans office conducted a number of outreach efforts in 1997 and participated in programs such as National Consumers Week, sponsored by the U.S. Office of Consumer Affairs as well as other consumer-related groups and associations. The FDIC frequently meets with community and consumer groups, bankers and government officials to exchange views about community reinvestment and fair lending issues. In 1997, the FDIC participated in 187 such events across the country. More than half were events to educate bankers and others about CRA and fair lending topics. Other events focused on fostering partnerships between financial institutions and community-based organizations. The FDIC reached more than 6,000 bankers through these events. Other outreach efforts in 1997 included forming a focus group in Georgia to enhance communication between bankers and community representatives after claims of lending discrimination, and organizing roundtable discussions with bankers and a community organization to spur economic development in low- and moderate-income areas of Reno, NV. For more information on outreach efforts (click here). The FDIC broadened its use of Internet technology to communicate both inside and outside the agency. published on the FDIC's home page on the World Wide Web include FDIC "financial institution letters" (notices to the industry about proposed or new rules and procedures), press releases, speeches by the FDIC Chairman, congressional testimony, manuals, descriptions of banking laws, lists of asset information and banking statistics. Users of FDIC Internet offerings include bankers, regulators, financial analysts, journalists, stockbrokers, academics, consumers and others who want quick and easy access to the FDICs public information. FDIC employees from Washington (top) and Dallas participate in National Consumers Week outreach and education efforts. Several new features were added to the FDICs home page in 1997, including an electronic reading room where the public may peruse FDIC publications; an online form to request information from corporate databases; and custom-ized reports with FDIC and banking industry information. Another new feature provides state banking agencies and other regulators secure access to confidential financial, supervisory and policy data. For students in kinder-garten through grade 12, the FDICs home page now offers interesting and useful information about the FDIC and the banking system. (For a general description of FDIC Internet offerings (click here).